I’m only going to participate in two reading/blogging challenges next year, and this is one of them. 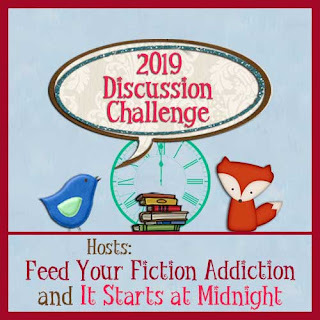 I’m signing up for the Discussion Challenge hosted by Feed Your Fiction Addiction and It Starts At Midnight. I’m hoping to write at least 12 discussions. If you’d like to join me, sign up here. On Tuesday I showed you festive holiday book photos. 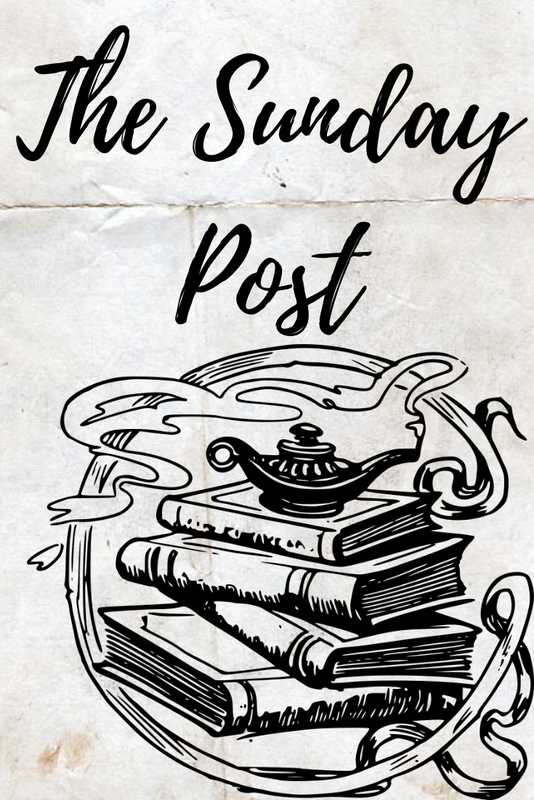 On Thursday I listed some oddities that I discovered in this blog’s comment section. On Saturday I reviewed two books about religion gone wrong. On Tuesday I show you what I’m (hopefully) reading this winter. On Thursday I talk about Christmas traditions. On Saturday I review two books about adventures. 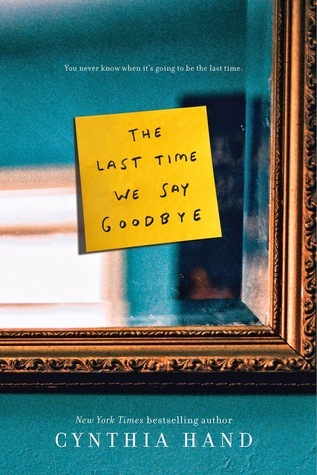 Last week, I finished The Last Time We Say Goodbye by Cynthia Hand. It was okay. I like the characters and the themes. It’s a realistic look at how people handle the unexpected suicide of a family member. I wish there was more plot. It feels like the book was building to something, but then nothing happened. 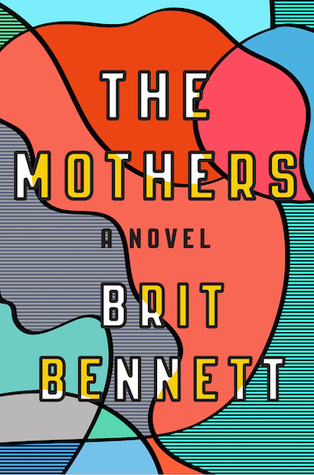 Then, I read The Mothers by Brit Bennett. Can I just say “ditto” about this book? I like the characters and the themes. I like that it’s narrated by a Greek chorus of gossipy “church mothers” who are in everybody’s business. For most of the book, nothing happens. Right now, I’m reading How It Went Down by Kekla Magoon. Finally, a book with a plot! It has too many characters, but I currently love it. It’s about a crime that had a ton of witnesses, but nobody can agree on what happened. 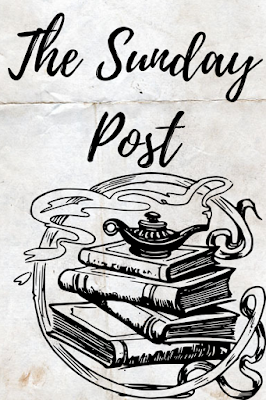 Angela @ Musings of a Literary Wanderer asks how you define success as a book blogger. That's a good question. Writing my Christmas traditions post was fun. It’ll be up on Thursday. The research was very entertaining. Walking my dog. That’s always more pleasant when it’s not freezing outside. I think I posted on Instagram every day last week. Go me! I’m terrible at being consistent. The Great American Baking Show is back! I look forward to this show every year. It’s on ABC on Thursday nights. Thanks! I finished How It Went Down and loved it. I think the Hand book would work for me, because I am all about the character driven stories. I need almost no plot, but I need to feel a lot. Insta every day is an accomplishment. You are awesome! You have me really eager to read your traditions post. My family actually does have some Christmas traditions, which we still adhere to. I hope you like the Hand book! I think my issue with it is that it started to have a plot, but then everything fizzled out and went nowhere. Discussion challenge sounds interesting. I sometimes do the ABC challenge. It's a huge commitment but I learn lots from that one. The Discussion Challenge is a commitment, but I always have fun reading everybody’s discussions in the link up. Bloggers are very creative. Loved your festive holiday photos. Books can be so comforting to look at in a festive setting. I had a lot of fun taking them. Except for the glitter. There’s glitter EVERYWHERE! Good luck with your challenges! ;) I don't plan to do one so far.. I would only end up pressuring myself way to much. That’s exactly why I’m only doing 2 challenges next year. There’s too much pressure. Aren’t spammers great? I have no idea what’s going on in their minds . . .
I’m a character-based reader, too, but the characters have to be REALLY interesting to keep me reading without a plot. Any kind of junk food makes me happy :) Have a great week! A few years ago I went overboard with challenges and now I don't do any. Haha, I'm hoping one day I can work a challenge or two in for the year. Have a great week AJ, I can't wait to see what you plan to read this winter! I need to pull together my list too. This is Amber @ Du Livre btw. I tried to be really ambitious with my challenges this year because I wanted to get out of my comfort zone. I ended up (mostly) staying in my comfort zone and failing all of the challenges. Christmas Junk food is the best. I need to watch The Great American Baking Show, I always hear how great it is. Yes, watch it! It’s fun, and they make yummy-looking stuff. Oh, I'm so glad you're enjoying How It Went Down. I feel like it somehow got missed, with everyone reading All American Boys, The Hate U Give, and Dear Martin instead. I liked How It Went Down more than The Hate U Give. Why is The Hate U Give getting all of the attention?! Not fair. I'm not sure of what Christmas Junk food is, but any food makes me happy. =P I'm terrible at being consistent at my Instagram. Only once did I post on Instagram every day - and I'm still not sure of how I did it. Cookies! So many cookies. That’s my favorite Christmas junk food. How It Went Down sounds really interesting! And a little like Sadie, maybe, in how it plays with individual perception versus reality. I'm always on the hunt for new mystery/thriller novels to read. Hope you have a great week! I loved the different perspectives in How It Went Down. It’s interesting that multiple people can witness the same thing and come to different conclusions. Thank you for the shoutout! Ooh, I might have to try the baking show, it seems like everything else is on hiatus right now! Yes! Try the baking show. It’s fun and fills the gap while everything else is hiatusing (that’s totally a real word). I like your list of five things. My son and I have felt we need to get outside in the fresh year and have been doing some walking. My dog loves it:) I may try the discussion challenge this year. I haven't had much luck with doing them in the past but I want to try again. I love the Discussion Challenge. It forces me to be creative, which is really difficult sometimes! I'm the worst at posting on any social media consistently. I have heard good things about How It Went Down. I'm glad you're enjoying it. Happy reading! I’ve been terrible at social media this year. It makes me depressed, so I’ve been inconsistent. I’ve fallen into the trap of just using it for shameless self-promotion, which nobody likes. Haha, good to know that I’m not the only one who forgets to link up. Doooo it . . . . Still debating on whether I'm going to do any challenges this year. The Discussion one is new to me and interesting as it highlights doing more than just writing reviews. The Discussion Challenge is the only blogging challenge I’ve been able to succeed at. It’s pretty chill and doesn’t have a lot of rules. I included what I plan to read this month and next on my update post. My weekly updates. Yay for Christmas junk food!! And I'm sure your traditions post will be fun to read! I loved the writing style in The Mothers. It’s definitely unique. Posting daily is challenging. I don’t understand how people do it. When do they have time to take and edit all those photos? I love the idea of a monthly discussion challenge. I'm not good with challenges, though, so I think I will formally pass, but informally participate. Your spam comments post cracked me up! Thank you. I’m not good with challenges, either. That’s why I’m only doing 2 next year. I love the spam I get on my blog. It’s very special. LOL! I love your "If you don't read it, someone else will" under the featured imagine I don;t think I have noticed it before. I love Nicole's challenge! it's a MUST! I use a different caption every week. I’ve been doing it for so long that I’m running out of caption ideas. I love the Discussion Challenge. It’s my favorite bookish challenge. I haven't done one discussion post and I've blogging for over 5 years. Can you believe it? I don't think I'll sign up for the challenge, but maybe I should make a goal of doing at least one in 2019. Walking the dog in nice way to de-stress, and yes in good weather is a plus! I don’t blame you for not writing discussions. They’re hard! And I’m completely out of ideas for posts. I've just signed up for my first challenge (Back to the Classics) in years... hope to stick with it this time. I really enjoyed The Mothers. I think I'll pass on both books. I started "The Seven of Us" this weekend but didn't get far. There's only 4 in the family right now so I'm a tad curious how the seven is gonna get worked in. I need to make cheesecake and Christmas cookies next weekend. Will the Christmas madness ever end? It’ll probably end in January :). I love Christmas, even though I’m really, really tired. Good luck! Discussions are my favorite posts to read. Cheers for Christmas Junk Food!!! I gave up on challenges, though I used to LOVE them. Yeah, I’ve mostly given up on challenges, too. I did so bad on them this year. It’s discouraging. I've read a Kekla Magoon co-write that was pretty good. Awesome! I need to read more of her books. How It Went Down is really good. We've had good dog walking weather too. I think we're on our way to a brown Christmas which is really okay as far as I'm concerned. Come see my week here. Happy reading! We’ll probably have a dry, windy Christmas. Most of the snow has melted or blown away. Thanks! I think I’ve done it every year since it started. It’s my favorite challenge. We should be walking our dogs more, and we usually do, but we're mid-move right now! It makes everything more difficult, haha. Glad your weather has been enjoyable! Ours has been in the 60s the last few days, so we've really enjoyed it. I'm participating in this challenge next year, too! Though I think I'll be involved with more than two, because there are so many I didn't realize were out there. Good luck with your challenges! Thanks! Good luck with the move! I always catch you on Sundays, odd. Yay! Books with plots lol. I have no Christmas Traditions... I think next year I need to start making some for my own. I'm curious to see what yours are. I like books with plots :). I don’t have many Christmas traditions, either. I do eat frozen Tex-Mex food on Christmas because nobody wants to cook. I have seen The Mothers around a lot lately. I will have to add it to my growing TBR pile. It was super-popular when it was first published. I think the hype is dying down a little. It is so much more pleasant walking dogs when the weather isn't terrible. Christmas junkfood is always great. Good luck with the challenge! I must say that I do enjoy books that actually have a plot so I might skip both of these. Have a great week! My dog loves cold weather and gets really hyper, but I’m not a fan of getting dragged down the sidewalk by her while I’m freezing. Hurray for puppy walks! For us, it's trying to work around the super hot days, so we've finally got some good walking weather too! I'm (im)patiently waiting for another season of The Great British Baking Show to show up on Netflix! I love the British Baking Show. I’ve considered getting Netflix just so I can watch it whenever I want. I’m very bad at resisting junk food. I’ve been eating it for weeks. I'm doing a few challenges hosted by other people next year. I meant to do a post about it but time has been against me this week! Food is seriously the best part of christmas. Not even a contest. 😂😂And hurrah for dog walking! My dog absolutely hates walking for me, even though I specifically wanted a dog to go walking with me...typical. Also I vaguely remember reading The Last Time I Say Goodbye and it falling a bit short for me too. Food is the best part of Christmas. My dog loves walking. She gets so excited that she pretty much rips my arms off if I don’t walk fast enough. Ooo… Looking forward to the Christmas traditions post. A wonderful week to you!